A well-acted low budget horror that fails to live up to the hype. The wait for a decent horror movie goes on . . .
After all the buzz and promise, I came out of the cinema not in tears from fear and anxiety but tears of laughter. After enduring a slow burning 40-odd minute build up, the moment arrives. The moment in which the dreaded Babadook finally makes its appearance and boy, oh, boy . . .
His cry sounded like a demented sheep. Baaa Baaa Dook. His appearance? *POSSIBLE SPOILER ALERT* Nothingy more than Noel Fielding in his Hitcher get up from The Mighty Boosh. Minus the polo mint for an eye. And too much black lipstick. Oh! And of course, not forgetting those rubbery gloves that the Penguin wore in Batman Returns to complete the look. 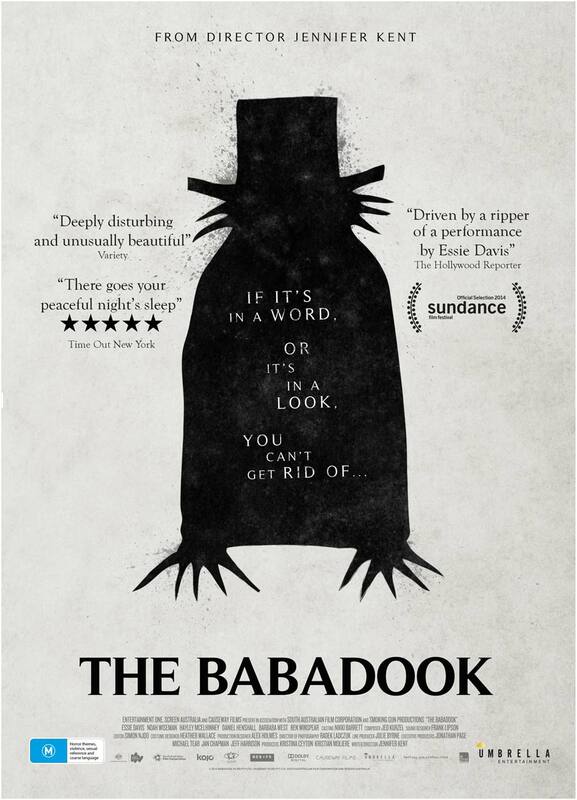 To be honest, The Babadook felt like it was going through the motions. Or more importantly, through the checklist. Creaky floorboard here. Closing door there. Predictable. It doesn’t help that when the creature finally makes its appearance, it disappoints on every level. It’s always a risk. I mean, look at Signs! After all the little teasers, the shadows in the night, the fast moving shapes and then we get that dreadful CGI thing. I was more freaked out by the demented pop up characters in the Babadook book (Totally rhymed there) than the actual demon. Thanks to the brilliant stop motion animation of Michael Cusack. A little harsh you might say. Now, there are some plaudits to be had here and it’s not all bad just a little disappointing. Writer/director Jennifer Kent actually tried to tell a story. One that deals with grief and overcoming fears. Commendable in this day of shaky handcam and found footage horror movies that are in need of some serious exorcisms from the cinema. And more importantly with two characters that you actually cared about. On first impressions, I was afraid that Daniel Henshall would annoy the hell out of me as Robbie. His initial monster hunter spiel was a little OTT but it did make for some comical moments as an exhausted Amelia (Essie Davis) must check every cupboard and nook and cranny. However, as his character continued acting out and we learn more about his behaviour, I applaud the young lad’s performance and by the end I was routing for him. Essie Davis (The Matrix Revolutions – I know? I’m still trying to work out who?) was fantastic and played the grief stricken mother. She works well with Henshall and they make a great and believable pairing. The film does deal with depression and paranoia quite well. And to be honest, there was a reasonable story beneath the surface. Amelia and Prue’s (Cathy Adamek) fractious sibling relationship was interesting and made for some heated drama with Prue prying into Robbie’s wellbeing. To be honest there were parts where I thought that maybe Tim Purcell’s Babadook wasn’t needed at all. Don’t get me wrong, the bumps in the night, the Babadook popping up in books, neighbour’s homes and televisions was eery and the strange noises did create good moments of suspense but the big pay off wasn’t worth the wait. The scuttling and the door knocking was creepy enough but you kept wanting more. Oh . . . And the finale! I could feel the burning eyes of my fellow cinema goers as I struggled to fight back the snorting. It actually made me snort with laughter. Without saying too much. It felt like something out of Home Alone with little ‘ol Robbie doing everything to protect his family. With his little arsenal of weaponry in tow, he fired cricket balls, set up trip wire on the stairs. Comical. The ending wasn’t bad but it was a little flat after a frenetic and tense few minutes. In fact it was a little weird and a little predictable. It had good moments, a couple of jumpy bits and tried to be a little more than your bog standard horror but it just didn’t polish off as well as you hoped. Certainly not the worst. In fact, the best one (So far) and it’s great to see a low budget Australian horror film prove what the big dumb commercialized American hybrids are failing to deliver. But at the same time, I am comparing it to the likes of As Above So Below, Oculus, Ouija and Annabelle, which doesn’t say a lot. And with the Pyramid approaching, I fear the wait for a decent horror film will continue.